SlugFest Games - Gen Con 2015 is Going to be Awesome! Gen Con 2015 is Going to be Awesome! SlugFest Games is excited to announce all the cool stuff that will be going on at Gen Con this year. 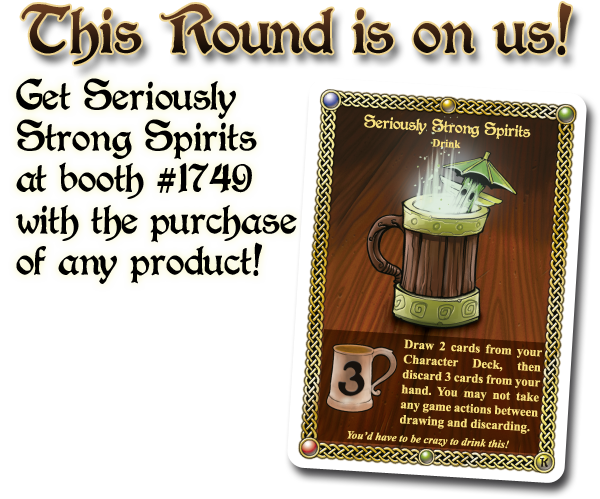 We’ll be hosting demos of our games at Booth #1749 this year, and will have all sorts of new swag for sale. So come by, sit down for a demo, and enjoy the con! We are pleased to announce that the stars have aligned and all three of 2015’s new Allies will be available for purchase on-site. That’s right! Halden, Zariah and Wrench will all be available in limited quantities at the show this year. Don’t miss out on your chance to get them early, as they won’t be hitting store shelves until November. Campaign Coins will be bringing us the first batch of metal coins and markers! These full-sized coins will give your RDI game plenty of heft and a lovely tactile feel. The coins and markers are beautifully sculpted and work with all our sets and boards. We’ll have 5-player and 1-player starter sets available as well as coin booster packs if you really want to feel the jingle of gold and platinum in your stash. RDI character buttons are back, featuring seven new characters! Grab one for your favorite character, or pick up all of them! We are also excited to release an RDI full-party poster! The cover for RDI5 turned out fantastic, and we’ll have a limited quantity of posters depicting the cover image available at the show. You can check out a shot of the poster on our Facebook Page here. The Red Dragon Inn 5 introduces 4 brand new characters to the game and provides long-time fans with something they’ve been drooling after: a place to store everything! The RDI5 comes in a massive, expanded box with storage space for every character, drink, mechanic and event deck released so far with room to grow. Included are replacement boards in glorious full color for each of the RDI characters, as well as newly-designed gold tokens. All of that and a heaping helping of additional storage solutions (deck dividers, baggies and more!) to top it all off! Unfortunately, without the aid of a time machine we will not have RDI5 available for purchase at the show. However, you will have the opportunity to pre-order your copy on at our booth! Don’t miss out on this chance, because this will be the last chance for folks who missed out on the Kickstarter to guarantee that they get the Promo Pack. You can learn more about The Red Dragon Inn 5 on its Product Page. It’s time for the return of the annual RDI Doppelganger Tournament Event Code: CGM1571153! Can you prove that you are the real hero against a table of your doppelgangers, and then go on to drink the rest of The Party under the table? Sign up and find out! The Doppelganger Tournament is an event unique to RDI. Each player will be assigned a random character from the cast of our beloved heroes, whom they will represent in a massive elimination tournament. The twist is that the first round of the tournament will have you facing off against 3 look-a-likes! How will you determine which of the four Fionas is the real Fiona? Why, by seeing who can party the hardest! There are only a handful of tickets left and you don’t want to miss out on the chance to win some absolutely fantastic prizes!